Pittsburgh-based InRhythm, Inc.s C-Metrics Projected Convenience Store Sales and Distribution report, which tracks convenience store category sales on a weekly basis, projects that overall sales in the health and beauty category (HBC) for 13 weeks ending February 11, 2012 will be flat. However, one category that did experience some growth was analgesics. Analgesics, which the report projects will account for 21.1 percent of total category dollar share during this period, increased by 1.7 share points. But, cough and cold remedies 16.6 percent HBC dollar share reflected a 1.9 share points decrease and stomach remedies, 7.2 percent of the category, were down by 1.3 share points. Kera Smith, merchandising specialist for Emmaus, Pennsylvania-based Top Star Express convenience stores, says her companys overall OTC sales have increased 10 percent from last year. She explains that the growth has come from trial size rather than full size products. Top Stars category strategy, she explains, is to stock the top full size SKUs to satisfy the customer who looks for the larger quantity while also offering an even broader variety in our trial size products. She maintains that the company views this is one the keys to continued growth. The chains HBC sales have gone up 2% since last year and we see the category continuing to increase, she says. We dont feel it will be as significant as the OTC growth, but there is opportunity within the category, Smith says. She explains that HBC accounts for .42 percent of store sales (excluding gas, lottery tickets or bus tickets). The OTC subset of that category brings in .18 percent of those sales. The companys top subcategories for growth last year were feminine products (23 percent), family planning (22 percent), cough and cold (21 percent) and analgesics (19 percent). Convenience Valet, for example, has helped us POG our stores, not only for their products, but for the entire category as well as promptly informing us about recalls and manufacturing issues and giving us temporary replacement item suggestions to ensure that our shelves stay fully stocked even if there are manufacturing issues that are out of our control, she says. InRhythm reports that the skincare/external care accounts for 10.5 percent of total HBC category dollar share, grooming aids 5.1 percent. And within these subsets, Packaged Facts research firm predicts that consumers will continue their quest for natural. “Green” consumers are more receptive [to these products], even to the point of remaining loyal to natural HBC brands in the recession of 2008-2009, the report says. What is Convenience Valet® offering in the health and beauty category to c-stores (this can include feminine care items, cosmetics, dental care, OTC drugs, condoms, baby care, etc.)? How has CV’s assortment in this category developed over the years? Convenience Valet® has over 400 items dedicated to servicing the needs of the Convenience Store class of trade. We specialize in providing a broad range of trial sized products within the health & beauty care category. From Advil to Zantac, we have hundreds of over-the-counter medications available including cough, cold, allergy and stomach remedies. Regarding personal care, our product selection covers the full range. Some of our better sellers include items such as condoms, 2 pack Huggies diapers with wipes, hand sanitizers, lip balm, eye care, and travel sized shampoo and hair spray. As well, Convenience Valet® has partnered with key manufacturers to offer GNC vitamins, Emergen-C powder drink mixes, Sheets energy strips and Protein To Go shots. Our assortment has grown over the years based on consumer demand and altered brand preference. We always monitor the retail trends and sales data to ensure we offer the best selling items. We have the broadest selection available today. There are a few trends in the c-store industry that will influence the category. Price point and penny profit seem to be the largest factors when deciding the proper mix of items and sub-segments offered in the HBC category. Since this is a destination category it is important that retailers keep the mix of these sub-segments in mind as they review the section. Not having a sub-segment represented can lend itself to a lost sale for the retailer due to customer dissatisfaction. The more retailers realize that HBC provides the second highest profit within their store, the more they embrace the category overall. There are a growing number of independent retailers where planogrammed space may not be a priority. Weve color coded our cards to provide a turn-key way to display our assortment how the consumer shops. For example, all red cards are analgesics and all green cards are cold, sinus & allergy remedies. Finally, more c-stores are offering fresh, healthy food options and are slowly attracting more female consumers. These consumers will more readily reach for profit generating items within the HBC category such as GNC Vitamins, Emergen-C, Sheets Energy Strips and Protein To Go protein shots. Protein To Go Protein Shots are attracting new users into the category. The French Vanilla Latte product from Protein To Go tastes similar to a Frappuccino so more women are choosing this high protein shot since it contains no fat and just 1 carbohydrate. Sheets Energy Strips are also attracting more people into the category including women through national advertising partnerships with Jersey Shore, The Today Show, Good Morning America and US Weekly. 3. Any changes of note in how c-stores are handling this category, such as increasing or decreasing space, requiring certain types of displays or packaging, etc.? Please discuss your product/program offerings for c-stores and how it has evolved recently. This is normally a tough category for c-stores, would you agree? Please explain how you help them sell HBC and Gen merchandise more effectively and why this is good for their business. Convenience Valet® provides the largest selection of nationally branded convenience and travel products within the Health & Wellness category. Our program provides category management expertise and planograms both built off multiple data points including syndicated data. HBC and General Merchandise are often overlooked yet can provide retailers with exceptional margin. We know that 79% of products purchased within the c-store are consumed within 60 minutes. We also know that nationally branded products appeal more to this consumer based on sales volume. 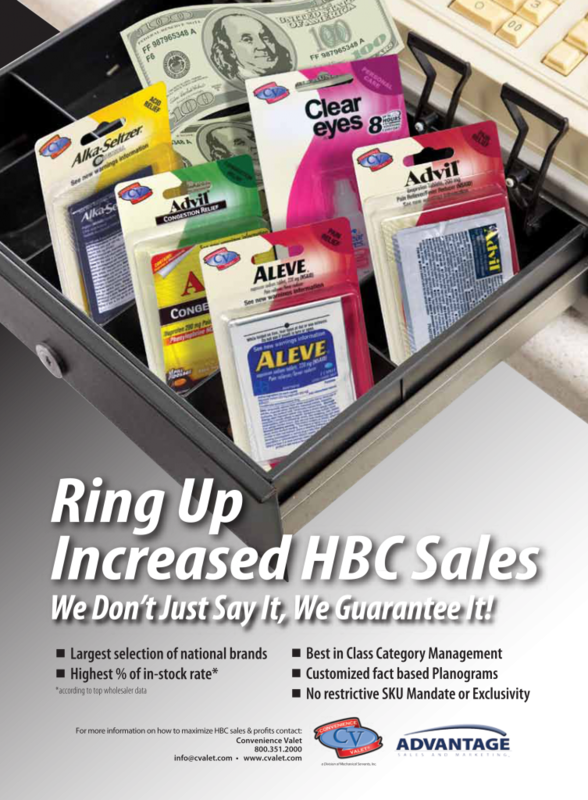 Our single & double dose over the counter HBC product meets the needs of consumers by providing instant relief. Our products meet the needs of retailers as well by keeping cost of inventory low and by our color coded clear packaging to help categorize products. These categories are profit generators for the retailer with typical gross margins exceeding 50%. What are your convenience store best-sellers? Why? Our best selling products are products within the analgesics category followed by upper respiratory and digestive health categories. Sheets Energy Strips were launched this summer and sales are extremely positive with our celebrity partners such as LeBron James, Shannon Elizabeth and Pitbull having a great impact to product awareness and sales. Energy, vitamins and supplements are currently driving the growth of the category. Are you introducing any new items? Yes, for the first time at NACS, we are introducing Sheets Energy Strips. Sheets Energy Strips, co-founded and endorsed by such athletes as LeBron James and Amare Stoudemarie, were launched in the summer of 2011. After being placed on your tongue, Sheets paper-thin strips quickly dissolve. Sheets Energy Strips are individually wrapped, require no water and come in two great flavors: Berry Burst and Cinnamon Rush. Distributed by Convenience Valet®, Sheets are already on the shelves at GNC stores, Walgreens, Walmart and 7-Eleven. They’re small enough to keep in your wallet, won’t spoil or melt and have no calories, carbohydrates or sugar. Each strip contains vitamins B5, B6, B12, E, biotin and 50 milligrams of caffeine. There’s a $10 million marketing campaign to support the launch and the product has earned Best New Product from the ECRM show. Well be featuring Sheets Energy Strips within our NACS booth, #5235. What has captured customer interest recently in this area? According to current C-Store specific IRI data, the sub-categories showing the most gains include energy, vitamins and supplements. Specifically, GNC VitaPak and Emergen-C have shown solid sales growth. How has the growth in this category been lately? 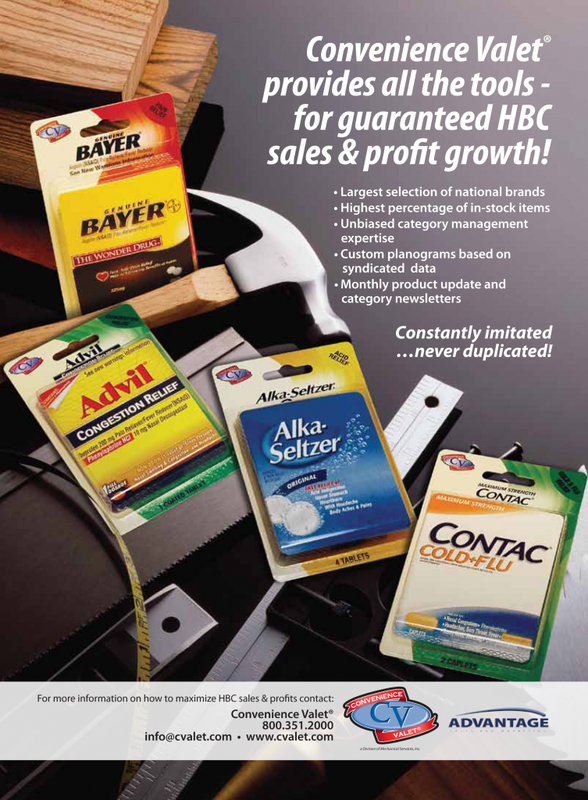 The sales numbers within the HBC category have been explosive since NACS classified Energy and Energy Shots as a sub-segment of HBC. However, excluding the energy information, core HBC items have grown slightly and Convenience Valet® has recognized strong gains through many of our new products including Sheets Energy Strips, Emergen-C and GNC vitamins. What are the current trends in health and beauty products? Were regularly watching trends through IRI and wholesaler data and the Energy category has shown that it is far from being a mature category. Energy is on trend within the HBC category and new products such as energy shots and Sheets Energy Strips have continued to support the growth of the category overall. What is the future of health and wellness products in general in convenience stores? The future is bright for the HBC category when done well – optimizing category management including pricing, assortment and planogram, etc. HBC is the second highest GM% category in the store, second only to ice. We as manufacturers need to continue to partner with our retail customers to ensure strategies are on-target to successfully compete with the blurring of retail channels. Convenience Valet is a leading value-added distributor of branded convenience / travel size health and beauty care products, over-the-counter drugs, personal care products and sundries sold in small-portion packages.